Polyurethane foam collars are die cut to specific sizes for improved fitting. Foam is covered with a soft beige stockinette. Available in narrow and regular widths. Traditional low contour design maintains the head in a neutral position. 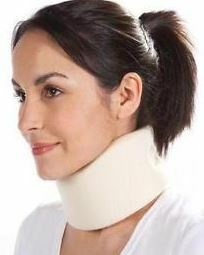 It supports your neck muscles and gives your spinal cord and ligaments time to heal. 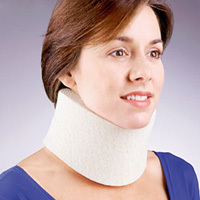 The collar is made of hard plastic, with Velcro straps to keep it closed. The front piece has a chin cup. Tracheostomy opening in front. 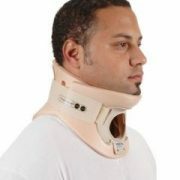 The back piece is curved and fits against the lower part of your head. 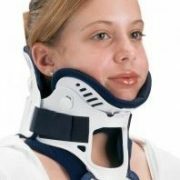 Lightweight molded foam with rigid plastic occipital and mandible posts for greater stabilization. Two piece construction for easy application with hook and pile closure. All models are fully radiolucent. 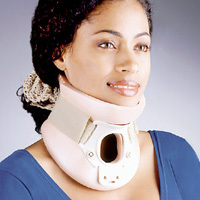 The Miami J Collar’s patented design meets the specialized needs of all those afflicted with cervical injuries. 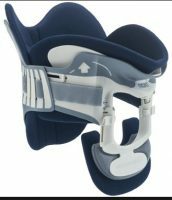 The Miami J offers features that enhance compliance and help speed recovery while ensuring immobilization, inhibition of skin breakdown and patient comfort.